Judith Wilkinson with artwork by Ditty Doornbos. 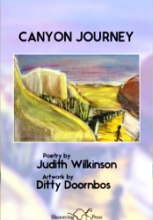 Canyon Journey is a collaborative work between a poet and a visual artist. For me, this opens up the challenging question of how two artists in different media can relate and spark each other. How has this collaboration worked out? What is the result like? And – because this is a review and you, the reader, might hope that I can point to some conclusions – how am I going to write about this collaboration (or confrontation?) in way that properly reflects what these two, a poet and and artist, have created by working together? Each of the thirteen poems by Judith Wilkinson faces a separate artwork (in colour) by Ditty Doornbos. The background information on the back cover is essential reading, placing the work in context. Both women had experienced chronic illness at the same time and during brief meetings and conversations discovered that they were sharing a similar range of imagery in their dreams. They subsequently worked together on their journals and drawings to produce this chapbook although the precise nature of their collaboration is not straightforward. The back cover appears to make the process clear: Some of the poems were sparked by Doornbos’s artwork, some of the artwork was inspired by Wilkinson’s poems which implies that both sides of the work developed at the same time. However, this balance is altered in the following sentence: Wilkinson based her sequence on the dream imagery and the factual details of Doornbos’s journey, in which the central image was a desert canyon that started out as an ominous landscape and evolved into a place of regeneration. That the drawings came first is borne out by Wilkinson’s note on the Acknowledgements page, confirming that the sequence was inspired by Doornbos’s drawings. What is clear, however, is how compelling for Wilkinson is the image of a canyon, with its sense of trapped space and imprisonment. Already she has established a geography for her illness, and has moved into the metaphors of travel and journeying. Separated from what the reader would regard as the ordinary world, ‘the logic of horizons’, she shows us the distance between ‘up there’ – the remote world of those who can reach out to light and and air – and her own trapped, cramped space within illness: ‘… this shaft is too deep,/ the walls too slippery/ and I lack rope, gear, skill.’ In just one stanza she has introduced herself as our guide through this ‘canyon’. Here, and throughout most of the collection, she uses free verse and stanzas of irregular length, following the natural rhythms of speech and breath. The use of ‘let’ is nicely ambiguous: it hovers between ‘allow’ and something closer to a petition, a prayer. The repetition of ‘beckoning’ recalls the distance Wilkinson has already created. Her poem begins to feel like a descent in to the underworld. allow a root to sprout, a shoot to scramble through. From this point some poems are first person singular, some first person plural: there is interplay between I/you/we and writing/drawing and shared dreams. These bring a new dimension, ‘Somewhere between yet and not yet’ (from ‘Too Early’) and elements of myth, expressed through animal figures which give shape to the terrors haunting the strange, remote landscape of illness. carved in the rock face above me. while they watched over me. There are no consolations from religion in these poems. Even so, that stanza carries a faint echo of Psalm 23 – ‘Yea, though I walk through the valley of the shadow of death …’ – which continues in to the extended exploration of ‘walking’ in the following poem: it’s a walking that brings not only a confirmation of place/identity but ‘the fact that I am wearing out my shoes’ – proof of achievement, a hint of physical strength restored. there is the hoped-for resolution, and a harking-back to the ‘beautiful customs’ of the opening poem. It’s not an easy resolution: while ‘Most days I’m at my drawing table,/ learning to trust the blank page’s undoing.’ the poem – and the collection – ends with the recognition that ‘the canyon stays’, a place to which the poet could be returned at any time. The lack of a full stop leaves this possibility open. While the collaborative nature of this collection is confirmed in the final poems I find it harder to write about the role the artwork plays in the book in front of me. The colours are powerful, some of the images – particularly a menacing black eagle – were compelling but it is to Wilkinson’s language that I turn, every time. Would I have found the poems as effective without the artwork? I suspect I would. But to remove the artwork would be to undermine the celebration of working together to create not only this book but a new shared life which is the culmination of the long journey through the canyon. Prior to this Judith Wilkinson was familiar to me only through her translations of the Dutch poet Toon Tellegen. This sequence confirms the status of her own work. It joins the ranks of books about surviving and how to survive and it is her attentiveness to language that makes it memorable.